the Islander Hotel Senior Women’s and Bank of the South Pacific Under 14 Girls Round Cup championship for 2015 over the weekend. In the Van’s Premier Men’s division Tupapa lead ahead of their closes opponents Titikaveka FC who placed second place. A battle on the pitch in the weekend was the deciding factor between Nikao Sokattak, Puaikura and Matavera to take the third spot. 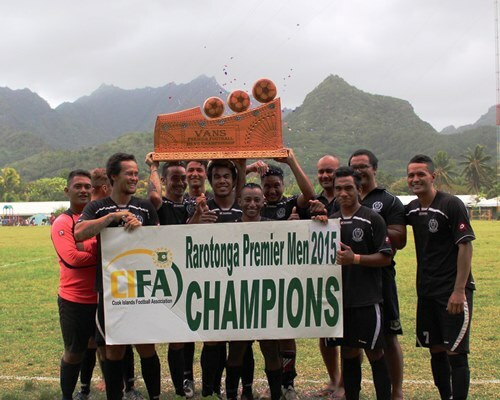 Puaikura claimed third place with a win against Avatiu and goal difference. In the Islander Hotel Senior Women’s division Tupapa Maraerenga also won the title over arch rivals Nikao Sokattak with Titikaveka coming in at third place. In the Under 17 men’s Nikao Sokattak won first place and Tupapa Maraerenga claimed second place. In the Under 14 Girls Tupapa Maraerenga won first place and Puaikura claimed second place. In the Under 14 Boys Tupapa Maraerenga won first place and Puaikura claimed second place.